I really don’t know why this movie is not better regarded by horror fans – indeed some of the bad reviews baffle me. Is the problem that the movie is as much an historical melodrama as straightforward horror pic, that turns off the horror crowd? Titled Mania for it’s US release the film opens with the words – “We make no apologies to the dead….It is all true” – flashing across the screen, the film then takes us to a grim graveyard scene in which two low life characters, Burke and Hare, lift a fresh cadaver from the ground. Yes this is the story of real life grave-robbers Burke and Hare who supplied cadavers to Doctor Knox for use in his research. When the doctor requests fresher bodies, Burke and Hare resort to murder rather than grave-robbing. Knox is played by Peter Cushing, then a massive success thanks to his association with Hammer Films, and the actor does well with the character. Outwardly presenting a charming gentleman but also a man driven by his work who turns a blind eye to the fact that the bodies he is being supplied with a likely murder victims. The character Cushing portrays is a close relation to his Baron Frankenstein. He is an arrogant man and considers the death of a few prostitutes and beggars not to0 much of a price to pay for medical advancement. 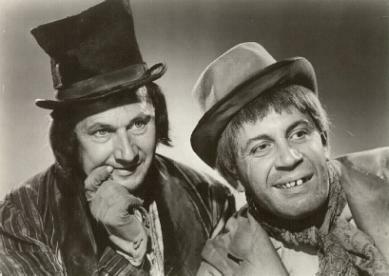 Burke and Hare themselves are played by Donald Pleasence and George Rose and they steal every scene they appear in. Several scenes are particularly disturbing, especially when Pleasance dances about like a loon while his partner cooly strangles someone. It is testament to the brilliant acting, writing and direction that the violent scenes seem so gory and horrific when there is actually very little of the blood so common in horror pictures of the period. The film is also excellent at showing the contrasts between the poor and the wealthy, and the ending in which Cushing’s Knox receives a pardon for his crimes, seems to suggest that the lives of the prostitutes and beggars was not as important as that of an educated professional man in the society of the time. However he gets a comeuppance of sorts – Instead of helping mankind with great advances in medicine he has instead become no better, if not worse than Burke and Hare. It is telling when a child trembles before him and calls him an monster. This is truly a must see movie – the acting, writing and direction are spot on. It’s horror noir – a truly intelligent British horror film that is the equal of both The Whicker Man and Whitchfinder General which it most resembles – maybe not in theme or style but in the uncompromising search for reality in its presentation. 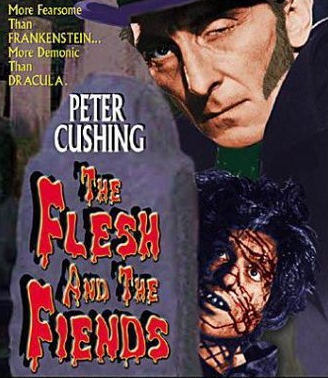 This entry was posted on 05/18/2011 at 9:30 am and is filed under burke and hare, HORROR MOVIES, peter cushing, the flesh and the fiends. You can follow any responses to this entry through the RSS 2.0 feed. You can leave a response, or trackback from your own site. Been following your blog for a few months now. Great posts and subjects! Please could you email me?